Stay on top of career opportunities! 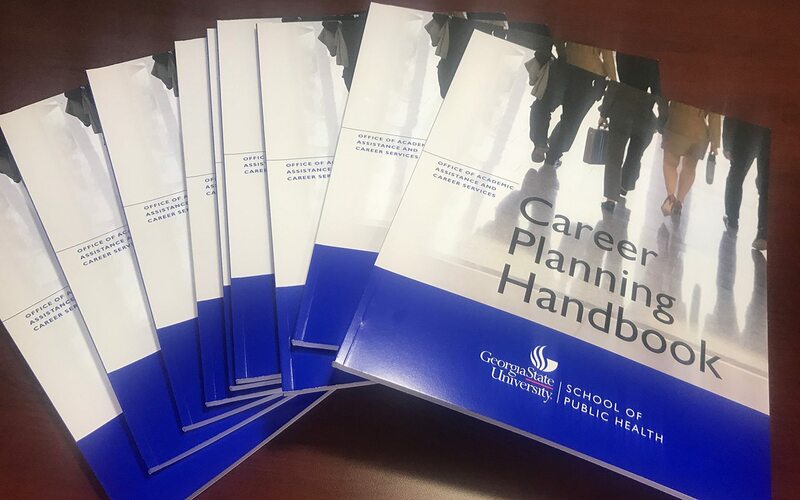 Download the Career Planning Handbook or pick up a copy in the Office of Academic Assistance and Career Services. Log into Handshake to see the full list of career events. There is an abundance of information, tips, templates, and examples to guide you in drafting a successful resume and cover letter. The key is to always have an updated resume available that can be tailored to specific opportunities as they arise. Ask friends and colleagues to review your resume to correct errors and ensure your descriptions are understood. Follow the 80/20 rule in your job search efforts – spend 80 percent of your time developing your professional network and 20 percent of your time applying to jobs. The best way to expand network and nurture professional relationships is through informational interviews. Create your LinkedIn profile and join the private LinkedIn group for Georgia State University public health students and alumni. Begin networking with other Georgia State-trained public health professionals and expand your opportunities, as well as your efforts to help others make connections. Request to join our LinkedIn Group. Your profile should indicate that you are a graduate or current student of public health at Georgia State – or include a message that explains your connection to the school of public health. Georgia State University Career Services is a full service center for all students. Drop-in resume review, mock interviewing, workshops, and self-assessments are just a few of the services provided by professionals in the center. Learn more by visiting their website or visiting on campus.